beginning to awaken and begin another cycle of growth. This signals the start of a busy time for bonsai enthusiasts. This rebirth every spring is regarded by those of us immersed in gardening as a miracle of nature. By now, you should have all your supplies ready for the repotting that you are planning to do this spring. Soil should be mixed and sifted. Pots should be clean and screens wired into the drainage holes. If previous years are an indication, the window for repotting your trees is quite short. The more you can get ready ahead of time, the more time you will have for actual repotting. Towards the end of the month you may be tempted to bring your bonsai out of storage. Be cautious! Those that have been stored in subdued light should be allowed a gradual transition to full outdoor exposure. Many of us follow a practice of moving bonsai outside during warm days and back inside at night or when temperatures dictate. Some type of wheeled conveyance is useful in this regard. Give your plants a final dormant oil or NEEM oil spray to prepare them for the beginning of bug season. As always, check your pots for moisture. As the growth cycle begins, your trees will need more water, however, guard against over watering. Continue to protect trees from freezing winds. Avoid frost contact on early flowering trees. Shelter trees from heavy snow and excessive rainfall. Do Not fertilize your trees at this time. In order to prepare you for "Spring" repotting, we need to be aware of and watch for the following. I stress here that "Spring" repotting doesn’t mean “calendar Spring” but the “Spring” for each individual tree. This may vary considerably depending on species, variety, area where grown and conditions of winter storage. In most cases, it is the deciduous trees that will give you the first indication that “spring” is approaching. For most deciduous trees the ideal time for repotting is when the leaf buds start to swell, but not yet opened into new leaves. This requires constant observation as we warm into spring. If they are hard and tight, it is too early. If you can see the green of unfolding new leaves, it’s too late. Most deciduous trees are so critical in the timing of repotting that these will probably be the first trees that you attend to. With conifers, Cedars, Spruces and Pines tend to be the earlier ones. 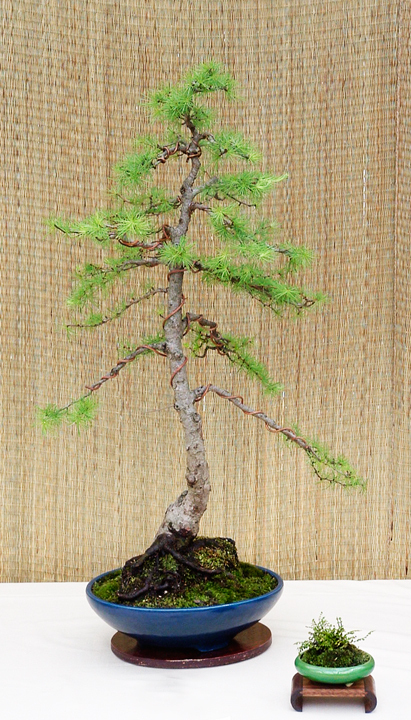 Larches, Cryptomerias and Junipers tend to start later and can be put toward the end of your schedule. As mentioned above, use the swelling of the new buds as a guide to ideal potting times. There are some exceptions and being aware of these can lighten your spring workload. Cotoneaster – late spring to summer during the growing season. If repotted at the correct time, most deciduous trees will withstand drastic root pruning. Conifers should be cut less drastically, removing approximately 1/3 of the roots. Most deciduous trees are also top pruned at this time, removing winter die-back and pruning for style. Conifers are pinched and pruned later in the spring. Do not attempt to wire and shape your trees AFTER repotting. The tree, even though it is wired into the pot, has not established it’s root system and the fine roots just emerging will be easily damaged. If you are going to wire, it should be done prior to repotting. Later in the month you may be tempted, by a few warm days, to bring trees out of winter storage. Be cautious. Trees that have been stored in subdued light may burn when exposed to direct sun. Allow for a gradual transition.